When I was a little girl, we were always given at least one Christmas gift to keep us busy over the holidays. 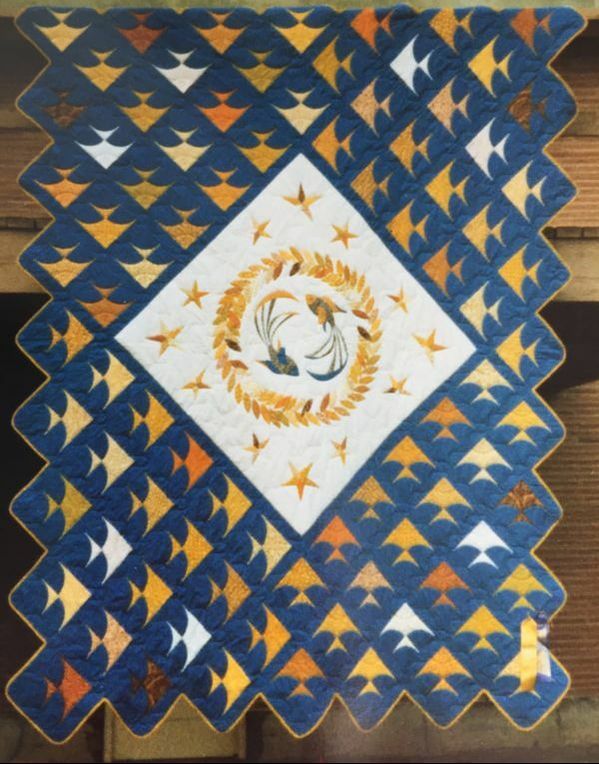 When I was about sixteen, my sister gave me this quilt kit. I finished one or two blocks then and gave up. My sister may have made a block, as well. I'm sure my mother sewed a couple, too, but then the kit was put into the attic. In the late '70s, I tried again. The original design called for green diamonds on the outer edge of each section of the plate and rows and rows of appliqued green diamonds on the border. The kit had printed the diamonds so that all four sides were on the bias. 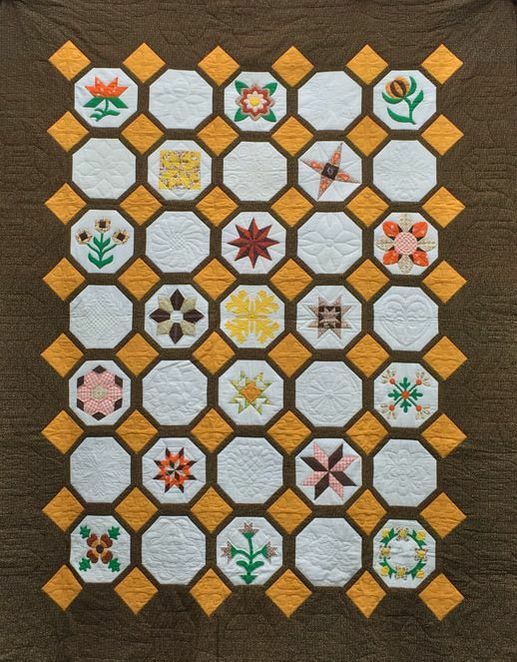 By then, we had misplaced one of the blocks so I bought more white fabric, needle-turned the plate edges and quilted the border diamonds instead of appliqueing them. I covered the messy center with a small red circle where the diamonds met. 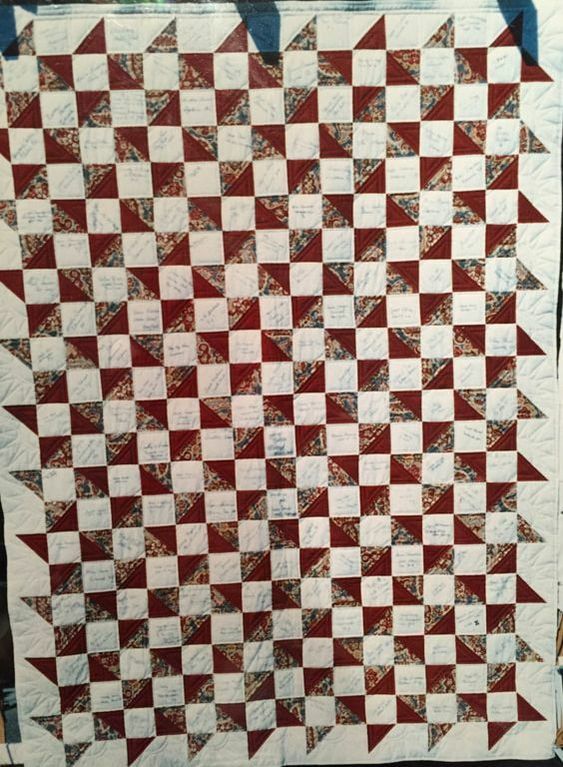 My hand quilting was really pretty good after finishing this one. This quilt is now a gift to my cousin Carol Ann in New York state. Gold & Brown Sampler, 1982 ? This is a quilt-as-you-go quilt in which I planned to do every quilt block alternating with every quilting design in the world. 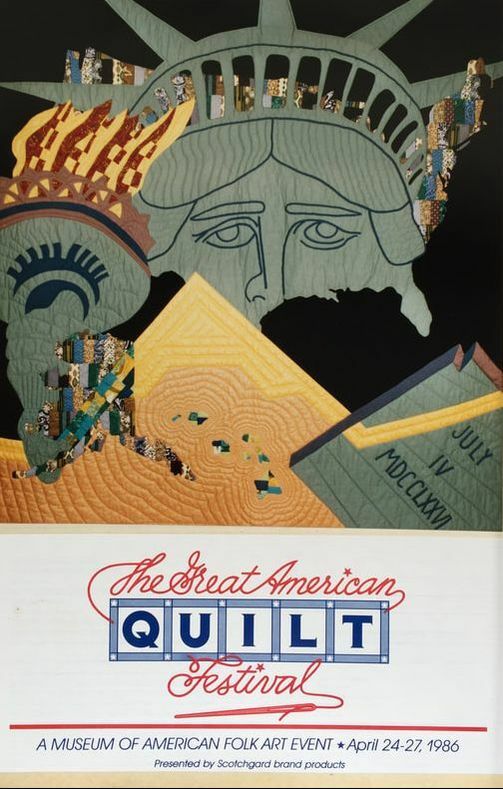 It seems ridiculous now, but at the time there weren't a lot of quilt books available and I was sure I was the only quilter on the West Coast. The gold squares are quilted with four little hearts and the border has quilted houses, each with a different detail. Each corner has a quilted sun face. Many of the designs had to be redrafted to fit within the white 10" square. I learned so much with this one. 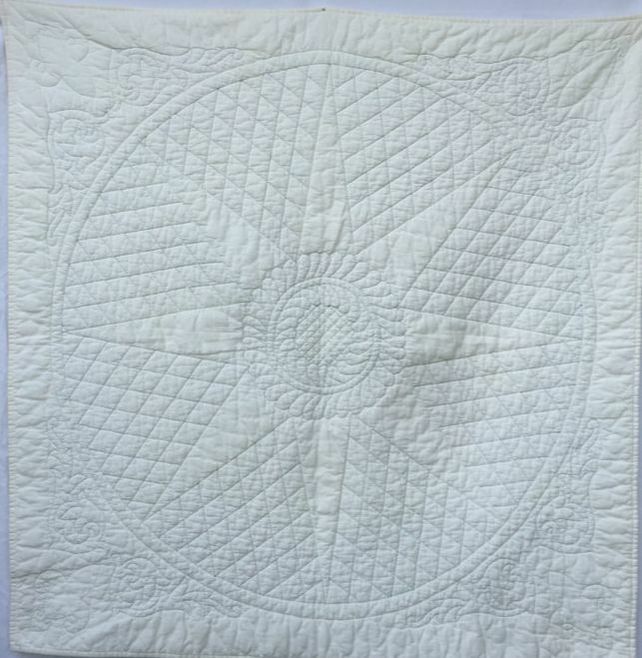 ​This quilt is my Drunkard's Path variation with an appliqued medallion in the center. 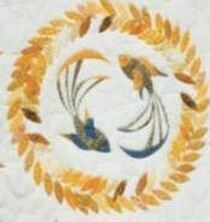 I saved all the leaf shapes left from the fish and used them for needle turn applique of the central wreath.. The quilted eyes of the fish are formed by drawing around my thimble. All the work was done by hand. I entered it in the Washington State Fair competition and won Best Original Design and Best Contemporary Quilt. "All Flags Flying," by Robert Bishop and Carter Houck. 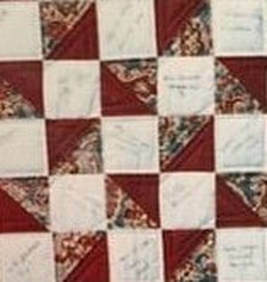 The first prize quilt was from California and was purchased by the Museum of American Folk Art. Then, all the quilts went on a two-year international show. 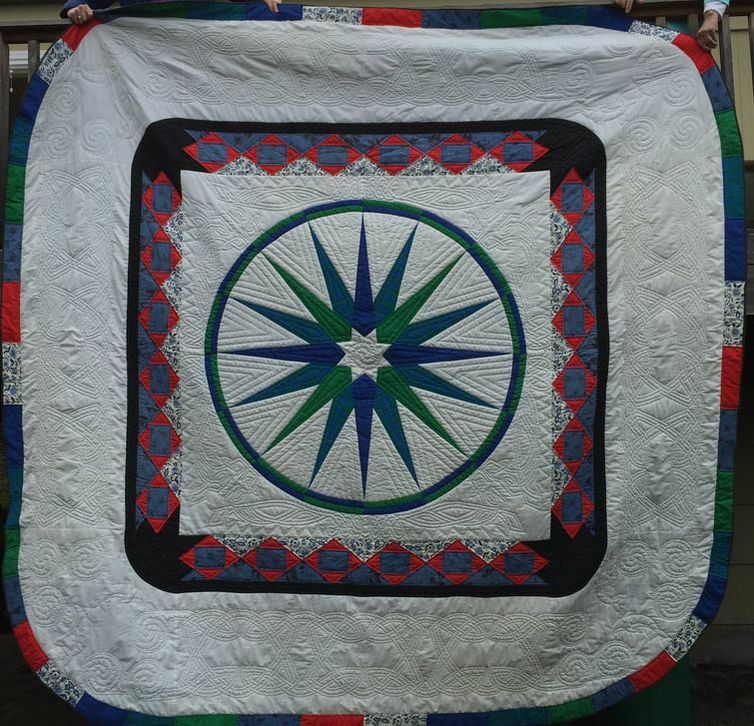 I donated my quilt to the Pacific Northwest Quilt & Fiber Arts Museum in La Conner, WA. If you look closely at the white squares you can see signatures I gathered from the people who joined me at The Great American Quilt Festival in New York. I collected the signatures at the festival and found the best place to gather them was in the line to the ladies room. I bought the patterned fabric while I was in New York and the Thursday Quilters helped me with the hand quilting. I also donated this quilt to the Pacific Northwest Quilt & Fiber Arts Museum in La Conner. 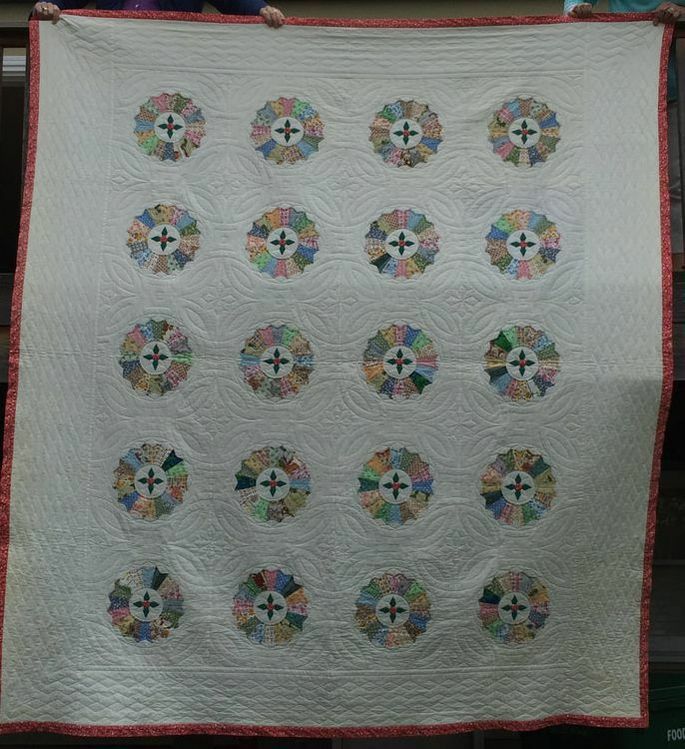 I wanted to have more control of my quilting stitch so I hand quilted this white quilt with teal and green cotton thread to make the stitches more apparent. 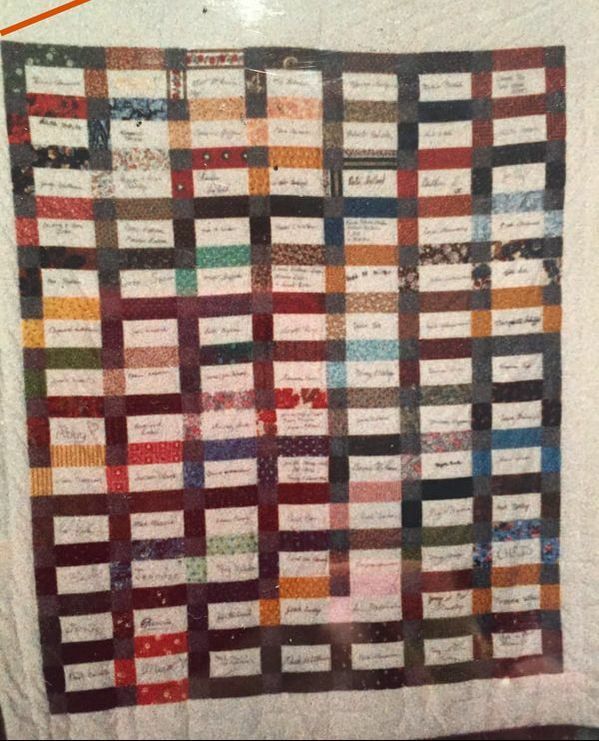 I made this quilt for my husband, Richard. 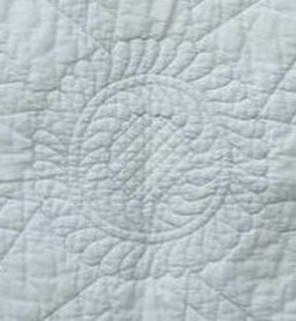 The quilt was all done by hand and remained fastened to my full-sized quilting frame for years. The inner white border is stitched with dragon boats prows and the outer white border is filled with Celtic Knot designs, spirals and porpoises.